Immediately after breakfast we went without any problem onshore. We crossed the gate of our terminal, and then we were walking in the heat. The port of Rio is tremendously large. Fortunately there was a bus free of charge to exit the port. Petra and Patty from Switzerland came with us. 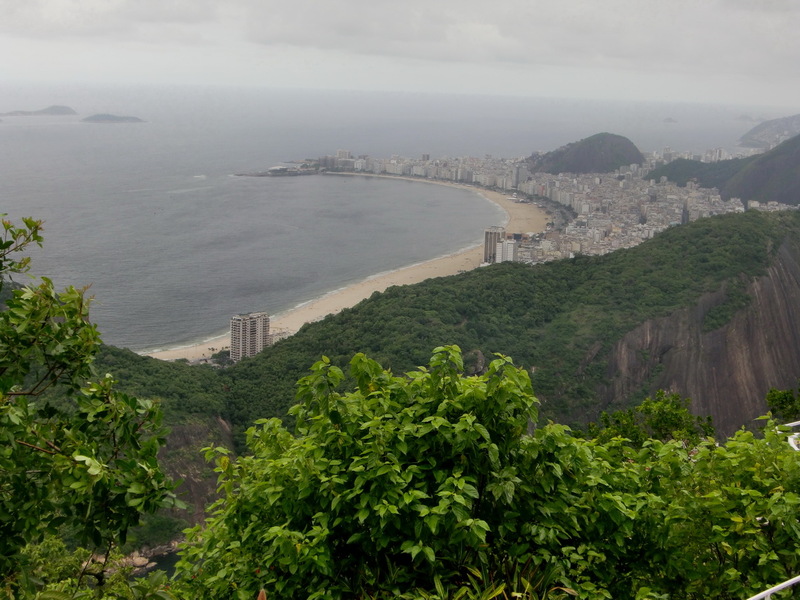 Our first idea was to visit the Christ monument on the Corcovado hill. But we changed our plan in the taxi, because Jesus was in heavy clouds. Instead we moved to the Sugar Loaf and took the funicular to the top. 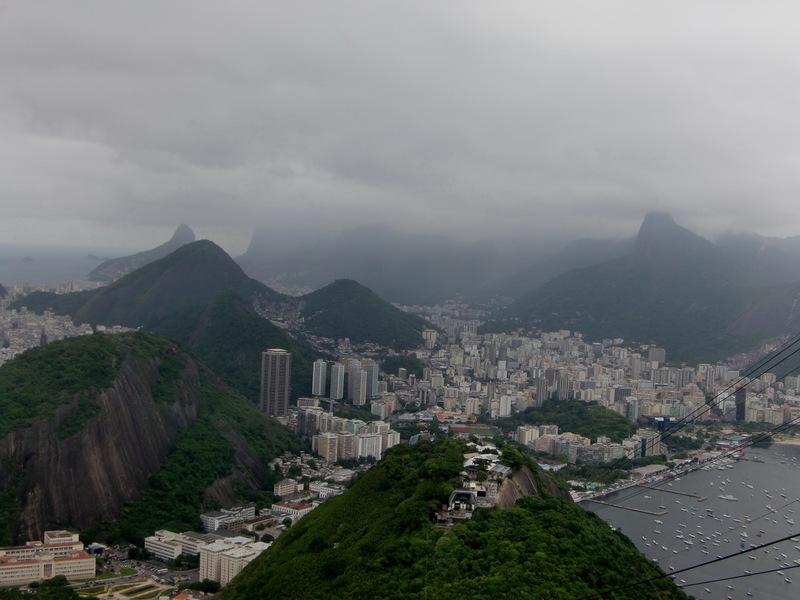 In spite of the grey clouds, we had stunning views from the top of the Sugar Loaf. 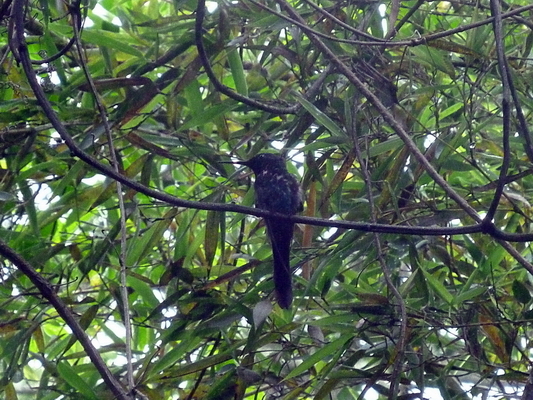 On top of the Sugar Loaf is a very nice, jungle like area, where you can walk a little bit. 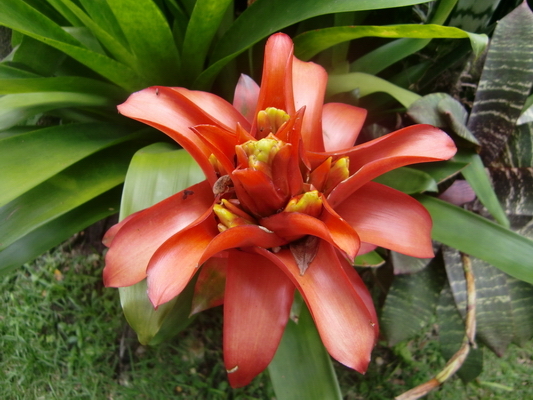 We saw little monkeys, hummingbirds and a lot of unknown, nice flowers there. Suddenly we saw Jesus. In the sun! 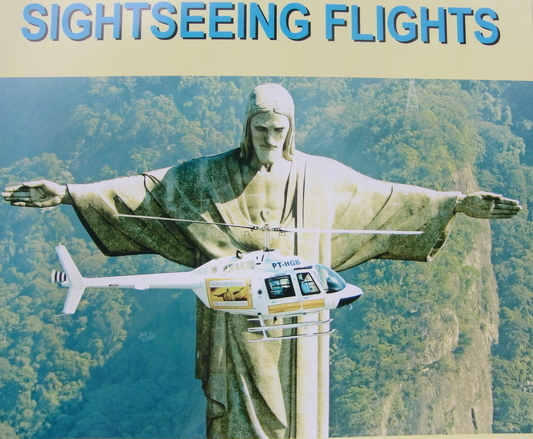 It's a big advertising poster for helicopter flights, which can be done from the middle section of the funicular. The next step was Copacabana and checking the water of the Atlantic Ocean - More than perfect: 25° Celsius water temperature, nice waves, crystal clean water, ... . Unfortunately we had to be back to our vessel at 5:00PM. Otherwise we could stay the whole night on the beach. But we were very thirsty and there is no beer available on the ship. So we enjoyed deeply the Brazilian beer! 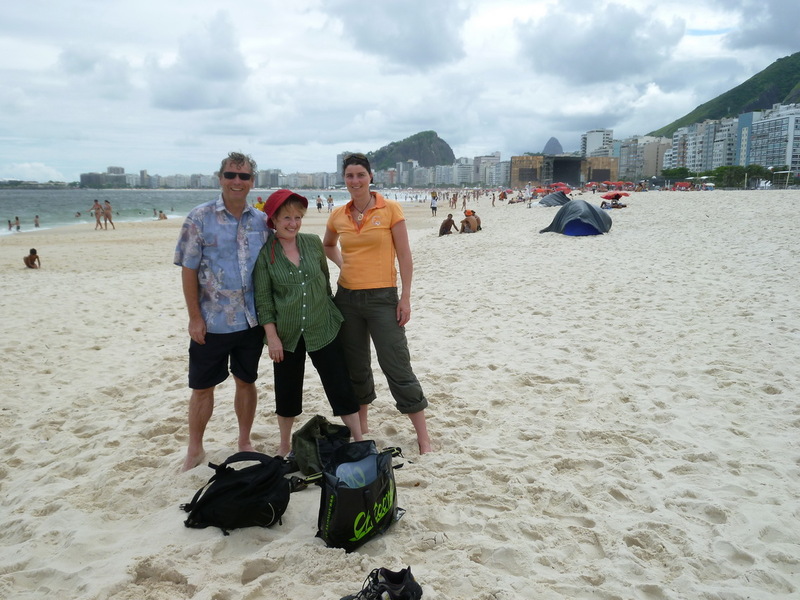 We arrived in Santos at the late afternoon on the next day. 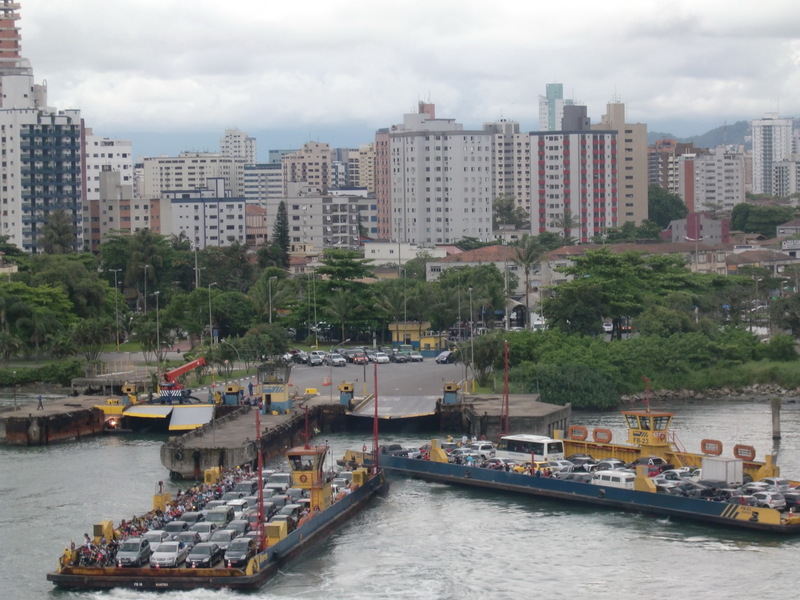 Santos is the port City of Sao Paolo, so its port is even bigger than Rio's. 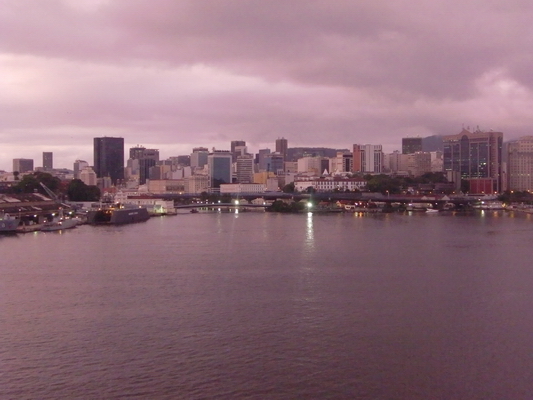 Santos has an impressive skyline from the Ocean. The port is on the other side of the City; we had to go through a channel more than two hours. We had stunning views to the life in the City. And of course based on Murphy's Law, our moorage was the last in an endless row. But finally at 9:00PM we could leave the Repubblica Argentina. 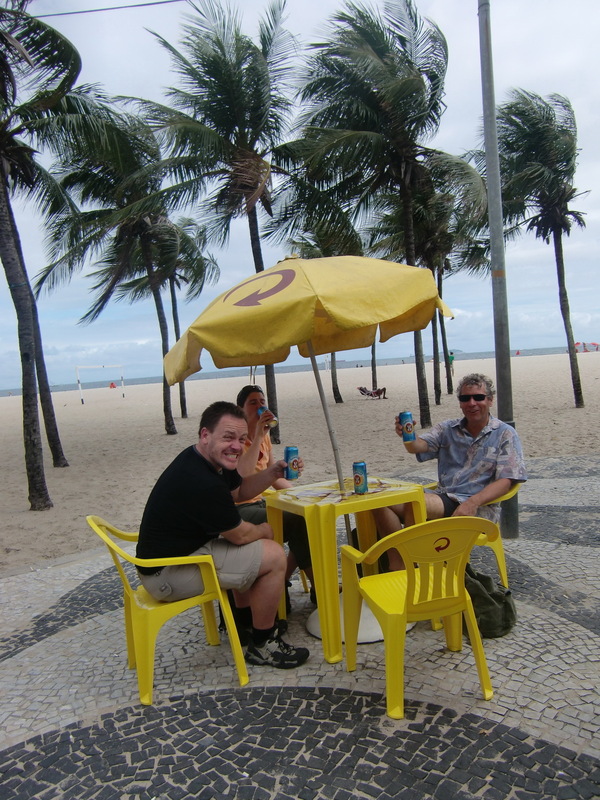 It was a very long night with Brazilian beer, beach, shops, Internet cafe, .... It was also a good exercise for New Year's Eve. We were so filled up with food that sleeping was unthinkable. Instead we moved to the cozy lounge of the laborers. Massimo and many of the Filipinos were there. And they love Karaoke. And Whisky. So we listened, and after some alcohol sung American schmaltzy songs. Only Massimo refused to sing a song! On the afternoon of the New Years Day the blue Atlantic water became very bown and a little bit muddy: We had arrived in the delta of the Rio de la Plata, the biggest river in the Southern part of South America. And there were many ships anchoring, because due to New Year the ports were closed. 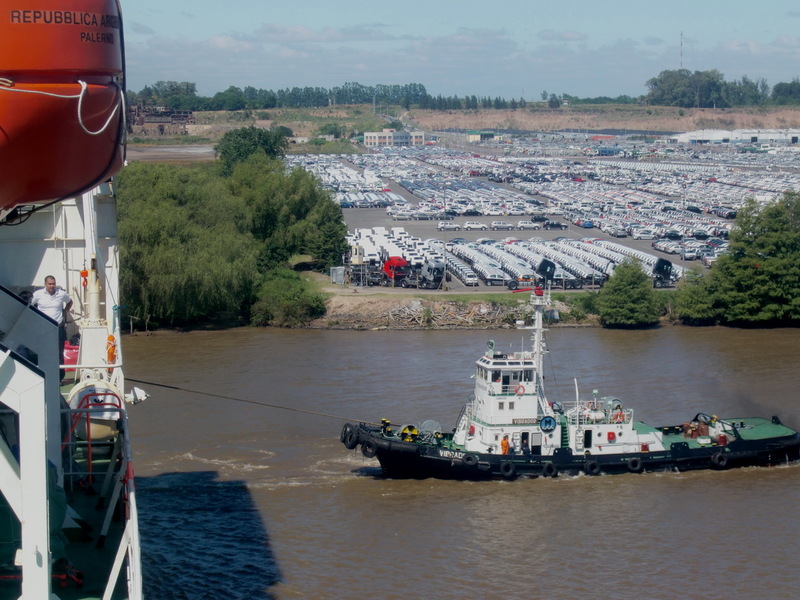 Also two other big freighters with cars were already waiting to deliver their goods to Zarate, the car exchange port of Argentina. 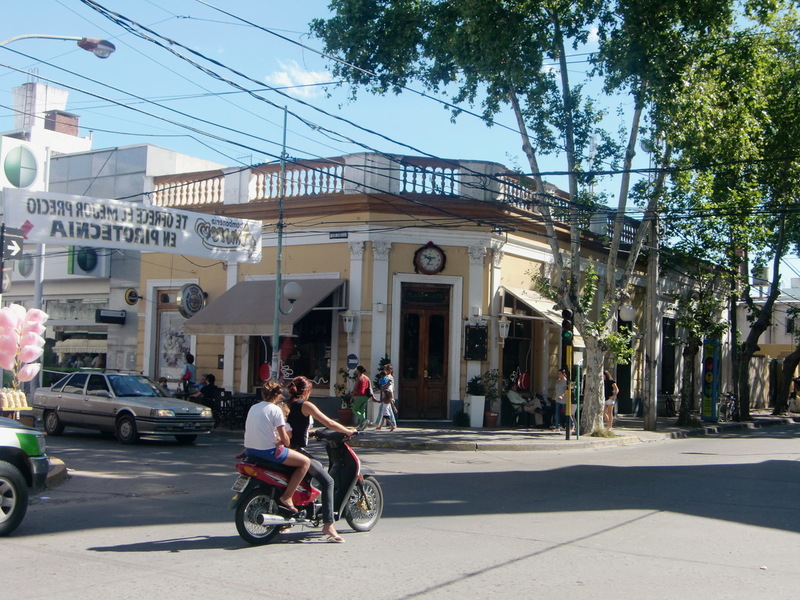 Zarate is a little town 80 kilometers North West of Buenos Aires. Its docks are small, just for two vessels like the Repubblica Argentina. So we had to wait until January 6th 2011, before we moved to Zarate. 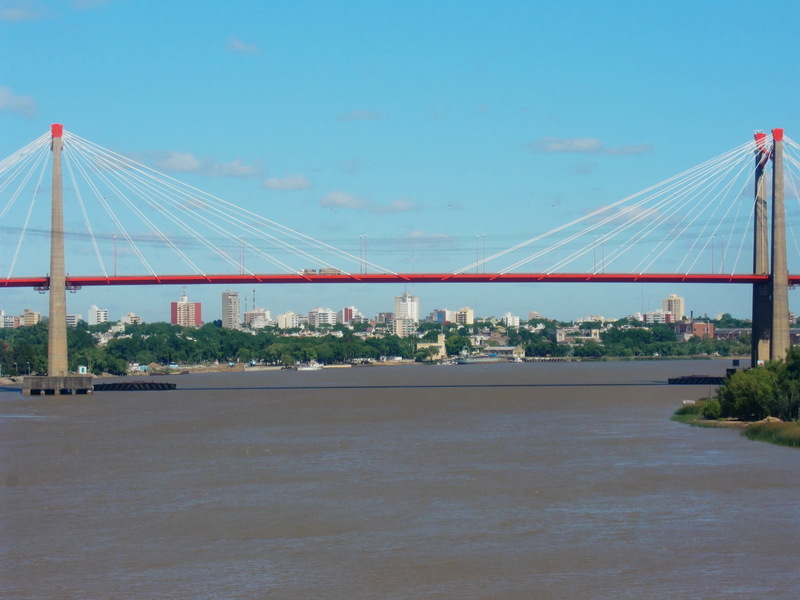 The way to Zarate is very impressive, because its along the Rio Parana. You see a lot in the shores, which are a little bit like jungle. We were half a day on the river beside the fact that it is just 80 kilometers. 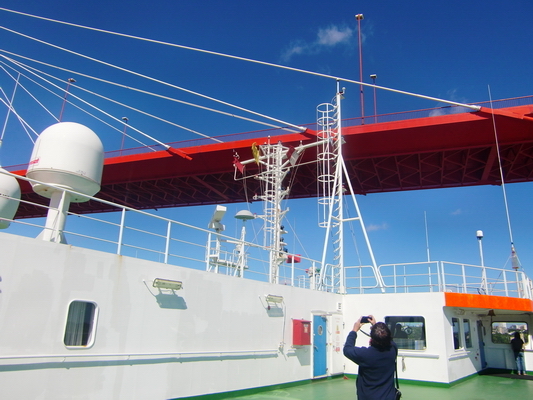 The ship had to reduce its speed to less than 20 kilometer per hour due the meanders of the river and also the current against us. The river looks very narrow from the top deck of our ship! And we had to cross a bridge. We were very astonished how many brand new cars were stored behind the docks: Many thousands and a lot of expensive ones like BMW 7ers. And we brought another 1000 cars with the Repubblica Argentina. Before we could moor the vessel had to be turned in the narrow river. Two little boats were pulling us in a 180 degree circle. And we wanted to get some money out of an ATM, but they stated always that they are under maintenance at the moment. Somebody told us that you can get money only after 4:00PM, when the banks are closed. Consequently we came back at 4:00PM. In front of all ATMs were long lines of people, wanting money. So we queued in and waited. And waited because there was no money still at 5:00PM and the queue became longer and longer. Somebody told us that there is a shortage of banknotes in Argentina. Finally we got some money at 5:30PM. Good luck! We left Zarate on the early afternoon the next day and we had to wait just in fron of Buenos Aires. 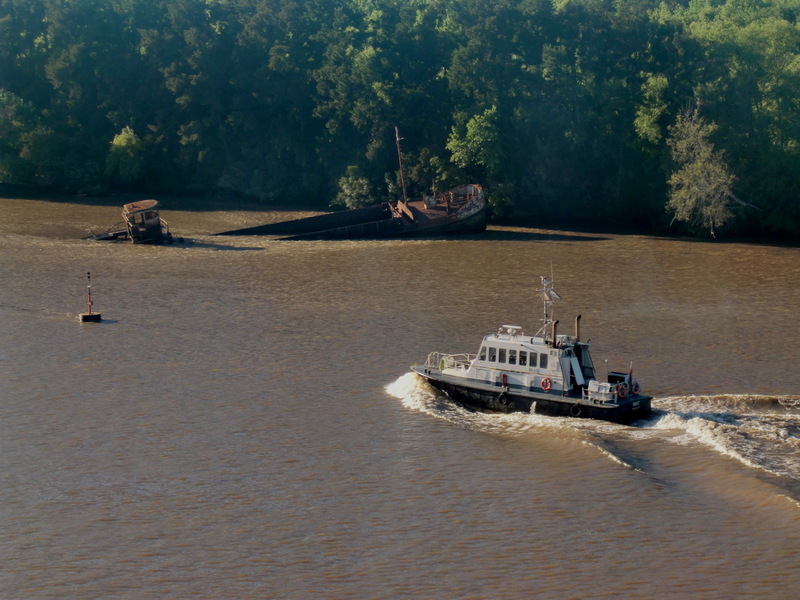 Finally, we arrived in Buenos Aires in the next morning, January 8th 2011, after 40 days on the vessel.